Martin Sullivan (second from the left on the photo below) introduced himself as just a person in the club of excellent volunteers who make this race happen. Acting as a representative for all the group, Martin answered my usual questions. Hello, on November 7th 2009, you’ll be organizing the Stone Cat Marathon Trail . Can you tell us where it is located? Willowdale State Forest Ipswich, Massachusetts. How old is the marathon and why was it created in the first place? 2009 will be the 9th annual – the race started in 2001. 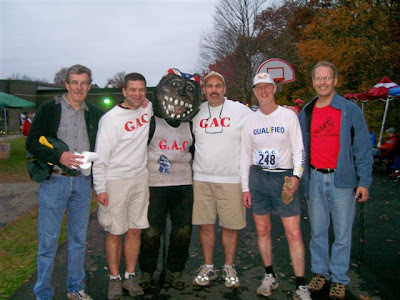 Our club, GAC (Gils Athletic Club) is a group of runners in Topsfield Massachusetts. We have done marathons, triathlons, ultramarathons around the world over the last 20+ years. We especially like to run trail ultramarathons and this race is our way of giving something back to the sport we love. The race course is a 12.5 mile loop through rolling forests on carriage trails and single track trails. The course is not very hilly and is a very runnable and somewhat challenging course – great for a first time trail marathon. Our marathon race is limited to 150 runners. We attract all types of runners – fast 3 hour trail marathon runners to first timer marathoners who will run for 6 or 7 hours. We also have a fifty mile race at the same time – four loops – also limited to 150 runners. The weather can range from freezing temperatures and snow to 65 °F (18°C) sunny conditions. Usually the race starts at 6:15 in the low forties and warms up to the mid fifties by noontime. We do not have any special activities planned at present. The marathon finished, what advice would you give a runner who has never been to Ipswich before? A good restaurant, a fancy sightseeing? Ipswich and Essex (the next town) are the world capital of fried clams – they were invented in Essex 93 years ago. The Clam Box in Ipswich and the Village Restaurant, Woodmans, Farnhams, and Essex Seafood all in Essex, serve fried clams – my favorite is Essex Seafood. Ipswich is also home to Crane Beach – a beautiful nature preserve featuring Crane Beach. A nice place to visit before or after the fried clams! In a single sentence, what would you tell the readers of 42k195 to make them register for the Stone Cat Marathon Trail? Our awesome volunteers will guarantee the runner an enjoyable rewarding experience. And the post-race microbrew from Stone Cat Ale!